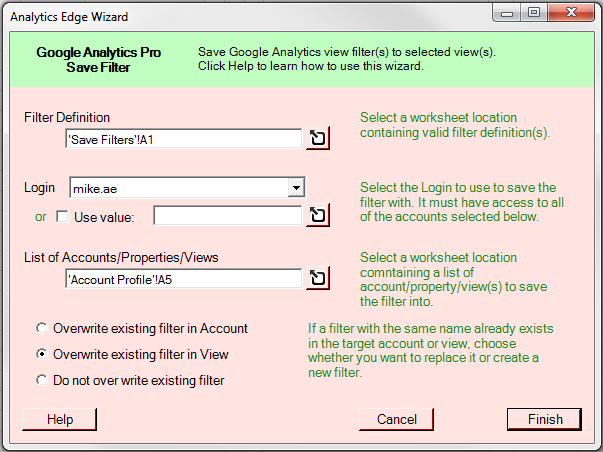 [Pro connector] Use this Analytics Edge wizard to save one or more view filters to one or more Google Analytics views. The filter(s) must be defined in a worksheet using columns that match what is generated by the Management Lists – Filter function. The Login to be used must either be selected or obtained from a worksheet link. NOTE: only logins that have been created with Manage access checked in the Account wizard will work! 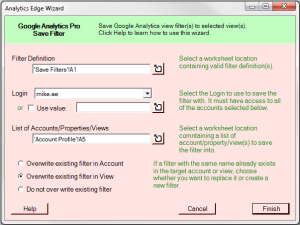 The target Google Analytics accounts and views must be listed in a worksheet using columns that match what is generated by the Management Lists – Account Summary function. This entry was posted in Google Analytics on 2015/07/19 by functions.